William Lister Lister was born in Sydney and between 1867 and 1888 worked and studied in England, France and Scotland before returning to Australia. He won the Wynne Prize for landscape seven times, was President of the Royal Art Society of New South Wales 1897-1941 and a trustee of the Art Gallery 1900-43. 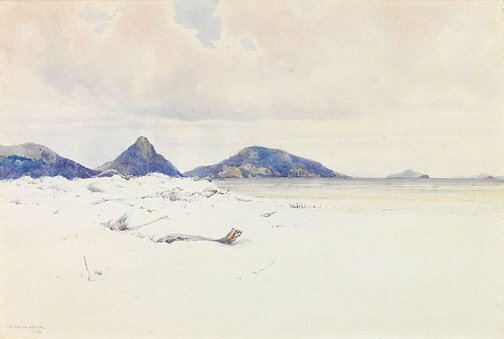 This is one of five major watercolours by Lister Lister in the collection; there are also eighteen early watercolours from 1875-76 bound into a small book. Port Stephens is on the coast of New South Wales, north of Newcastle. Signed and dated l.l., pale blue watercolour "W. LISTER LISTER/ -92". 19th century Australian watercolours, drawing and pastels from the Gallery's collection , Sydney, 2005, 108, 109 (colour illus. ).